First, I must confess that I do not follow the current generation of video games or gaming journalism and have not for years. To be brutally honest, I feel that I live in a time warp where the nineties never ended and thus I pay more attention to what Nintendo releases on the Virtual Console and retrogaming from the fourth to sixth generations. However, I find the controversy over Zoe Quinn and her exploits has aroused my attention because of the firestorm that erupted from it. To the six or seven who have not heard about it yet–Eron Gjoni, Ms. Quinn’s former boyfriend aired his dirty laundry about how she cheated on him with five other men. Something I would not normally condone because of how petty and vindictive it is but the interesting part of the post is one of the men she slept with was her boss, Joshua Boggs, another was Nathan Grayson, who writes or wrote for Kotaku and RockPaperShotgun, and the other three being independent developers. With Ms. Quinn being an independent developer herself, now (in)famous for Depression Quest, the implication now is that gaming journalism and the independent gaming scene itself is rife with neoptism, elitism, and no one is familiar with the term “conflict of interest.” It appears that the masses are rising up against them and the aforementioned Kotaku, RockPaperShotgun, as well as the Escapist, Destructoid and other gaming news sites are circling the wagons. Another thing I must make clear is that I do not identify myself as a feminist. Like the good reverend Martin Luther King Jr., I believe that people should be judged by the content of their character and not the color of their skin or the the chromosome they had received at conception. This group called The Fine Young Capitalists wanted to start a production that would promote female developers, something I actually believe would be an excellent opportunity for any woman to get her foot in the door– except Ms. Quinn torpedoed it. TFYC stated that they would create concept art for them to pitch their game, people on the Internet would vote on what game they wanted, and TFYC would produce said game without cost. The winner would receive 8% in royalties and the rest would go to charity. Somehow Ms. Quinn deemed this “oppressive” because “they expected women to work for free.” Apparently Ms. Quinn refused to consider that being the winning entry would look good on the winner’s resume. I mean, people use volunteer work as experience on their resumes doing things they feel passionate about, why not games? In any case, Ms. Quinn destroyed a perfectly good promotion that benefited women to suit her ideological ends. As Internet Aristocrat mentioned in my previous link, the gaming media has taken a “social justice” flavor that paints the vast majority of gamers as misogynistic troglodytes. The trouble with so-called “social justice” and its acolytes that dub themselves “warriors” is that their thinking restricts itself to binary think. From what I have seen on Tumblr (and needed to take a cold shower afterwards), Social Justice Warriors (SJWs) believe there are two categories of people: the oppressors, who are typically white cis males, and the oppressed/victims, who are everybody body else. The oppressors are responsible for everything that is wrong with society (i.e. the patriachy, for one) and the victims are not responsible for their actions because it is always the oppressors fault and never theirs. In the case of Ms. Quinn, she intertwined her professional life, something that is largely public, with her private like when she got under the sheets with Boggs and Grayson who were contemporaries of hers. Yes, Eron Gjoni did a something horrible by exposing her infidelities, but it solely Ms. Quinn’s fault for compromising what little professional integrity she had by sleeping with (allegedly) five guys. However, I believe that Zoe Quinn sees herself as a perpetual victim of “the system” and thus absolved of any responsibility of her actions. In some ways her mewling over her private life is an implicit suggestion that she sees herself as an inferior in need of an army of (mostly white cis male) white knights to defend her. An irony that is not lost on me because the idea of a woman dependent on males to defend her honor strikes me as very anti-feminist. In truth, no one wants you to be completely unbiased, as that’s usually inescapably dull. They just want you to have their bias. Right now, the general consensus of the games press is to be extremely biased against those who use terms like “White Knight” and “Social Justice Warrior,” often the same people who will harass and threaten and psychologically destroy those in the industry, or often the press themselves. And yet it is so easy to look the other way when Zoe Quinn send her pals in the video game press corps to ban a group that wanted to showcase women in video games from Twitter and dox one of the organizers. Their hypocrisy is galling, but at least the gaming press will learn a painful lesson (assuming they are capable): those that sow the wind will reap the hurricane. The media is nothing without the trust of its reader/viewership and in their attempts to suppress an honest discussion of this issue by issuing bans, the they only make themselves appear guiltier. As for me, I think I will go play some Super Metroid because as a misogynist white cis male gamer, I hate playing a game with a woman as a protagonist. 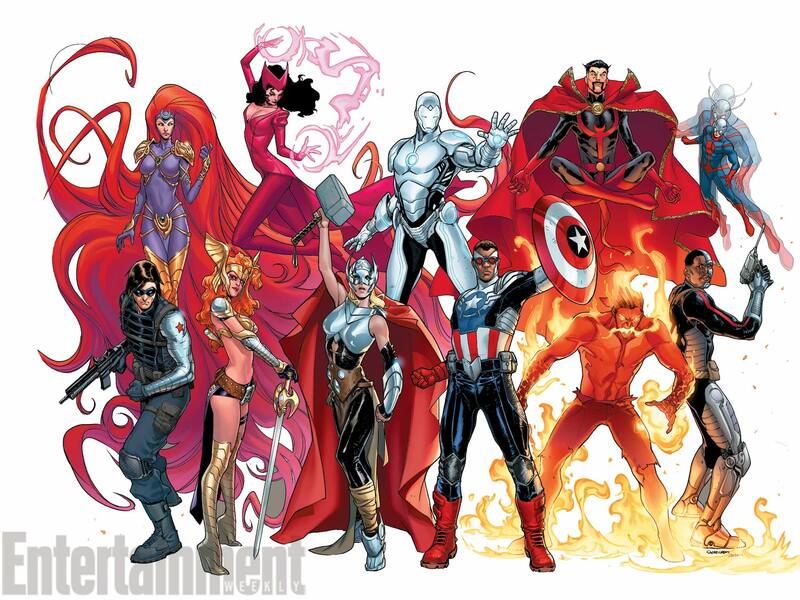 All-New Marvel NOW, same as the last. MARVEL: TAKE ALL THIS COOL SH*T MARVEL BE OUTIE! Pardon me if I must say that I can barely contain my indifference because it feels like Marvel retreading old ideas taken from the eighties and nineties. This is not the first time Odin has deemed Thor unworthy and this is not the first time that a woman has held Mjolnir, as Wonder Woman did in the likely non-canon DC vs. Marvel crossover from 1996 and Odin subjected Thor to the gender bender in the post-apocalyptic Earth X. As for Sam Wilson taking up the Star-Spangled Shield, it makes sense. He has been an associate and partner of Cap since the late sixties, after all. However, this is the second time Marvel has replaced Steve Rogers in a decade. Remember The Death of Captain America from 2007? A brainwashed Sharon Carter assassinated Steve Rogers shortly after the end of Civil War. (But as with most superheroes, he got better.) James Buchanan Barnes AKA Bucky AKA The Winter Soldier took up the mantle and actually held onto it for four years until Fear Itself in 2011. Marvel wants its readers to believe the shake up of the status quo will have a lasting impact on the comics, but I find that hard to believe when the House of Ideas is doing a little recycling. To be rather blunt, these press releases leave me rather skeptical that there will be a lasting impact. I admit Captain America’s death lasted and had an impact but then they hype the death of the Human Torch, then the death of Peter Parker to make way for the Superior Spider-Man, and now the Death of Wolverine. The former three came back, why should I believe the world’s most populate Canadian will take the dirt nap for long? In some ways, I see it as denial on Marvel’s part. Despite the ubiquity of superheroes in film, television, and other forms of marketing, none of that has translated into a long-term rise in sales within their native medium. DC Comics is just as guilty, but it is becoming so obvious on Marvel’s part. For all this talk of “diversity” (something I find lacking in comics, I admit) all this crowing about “NEW FEMALE THOR” and “NEW BLACK CAPTAIN AMERICA” comes off as crass marketing and attention-seeking by paying the barest lip service. Especially when we know that Thor will pick up Mjolnir again and Steve Rogers will regain the Super-Soldier Serum eventually. Sorry Marvel, as a firm believer in the Status Quo is God, I am not biting. Count me among the fans who are frustrated by the flaccid performance of 2011’s Green Lantern and the adequate-at-best Man of Steel. Marvel has been become a Hollywood juggernaut and a darling with fans while their distinguished competition sputters along. Even Wonder Woman, one of the comic book medium’s most iconic characters, cannot get a movie because, “she doesn’t have the single, clear, compelling story that everyone knows and recognizes” said DC Entertainment Chief, Diane Nelson, last year. I say that is a steaming load and I am reasonably certain that many of my fellow fans would agree. If DC has one major strength, it has prominent female characters who are not distaff counterparts of a male character (i.e. Wonder Woman and Black Canary) whereas Marvel’s best effort is Black Widow whose ability to carry a movie by herself is questionable (with no disrespect intended to the talented Scarlett Johansson.) Granted, there are rumors that a Wonder Woman movies is on DC’s slate, I am pessimistic over whether DC and Warner Bros. could pull it off or not. My main problem with DC is that they are complacent and believe that they cannot do any wrong, or at least they give me that impression. I recall how Christian Hoffer of the Outhouse, a site that specializes in satire, wrote that DC denied their requests for interviews based on the site’s biting criticism towards them. Granted, Marvel has demonstrated a similar predilection towards journalists, I believe that there is something terribly rotten with DC’s management when they reboot their universe to bring in new fans yet they paradoxically tell creators that they publish comics for forty-five year olds and likewise consider having only five percent of their readers claim to be new a success when they rolled out the New 52. To be blunt, it feels like DC Comics wants me to be grateful that they casually swept aside so many of the stories and irrevocably altered characters I enjoyed. Similarly, the vibe I get from the publicity pertaining to Dawn of Justice is they want me to be grateful that they are stuffing Wonder Woman, Aquaman, and Cyborg into a movie they have no real place in. It seems that DC Comics wants to do too much, too fast in its race against Marvel. Though I believed that Ryan Reynolds would have made an excellent Hal Jordan/Green Lantern with the right script and direction, they should have reserved Parallax for another film and possibly saved the Green Lantern Corps for the mid-credits stinger. (I would also like to say that the film would have failed for the same reasons if they had used John Stewart as the main protagonist.) Man of Steel suffered from the same problems where it could not decide whether it wanted to be like the Dark Knight trilogy or the more action-oriented Avengers. That is probably the sad part of all this, the Marvel Cinematic Universe is more of a spiritual successor to Richard Donner’s Superman from 1978 than any of DC’s recent offerings. It seems that Marvel knows what direction it was to take with its cinematic universe just as Donner had a vision for what he wanted to do with Superman though Edgar Wright’s departure from Ant-Man over “creative differences” demonstrates that it is not all lollipops and rainbows. I knew that they were reaching for something bigger and exciting when I saw that after-credit scene from the first Iron Man movie. I cannot say I get that feeling from Man of Steel or Dawn of Justice. I am sorry DC–actually, scratch that, why should I apologize? You have to earn my affection and my money if you are going to release any films based on your characters. While I thoroughly enjoy Arrow and eagerly await Flash, you really need to get your act together and stop tripping over yourself in your race to get Justice League to theaters. I plan to watch Guardians of Galaxy, and when I do, I will quietly lament the potential you are squandering.